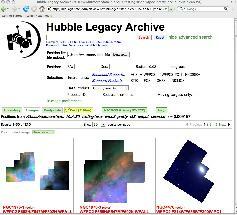 We are pleased to announce that the Hubble Legacy Archive (HLA) has entered its Data Release 2 (DR2) phase of operation. 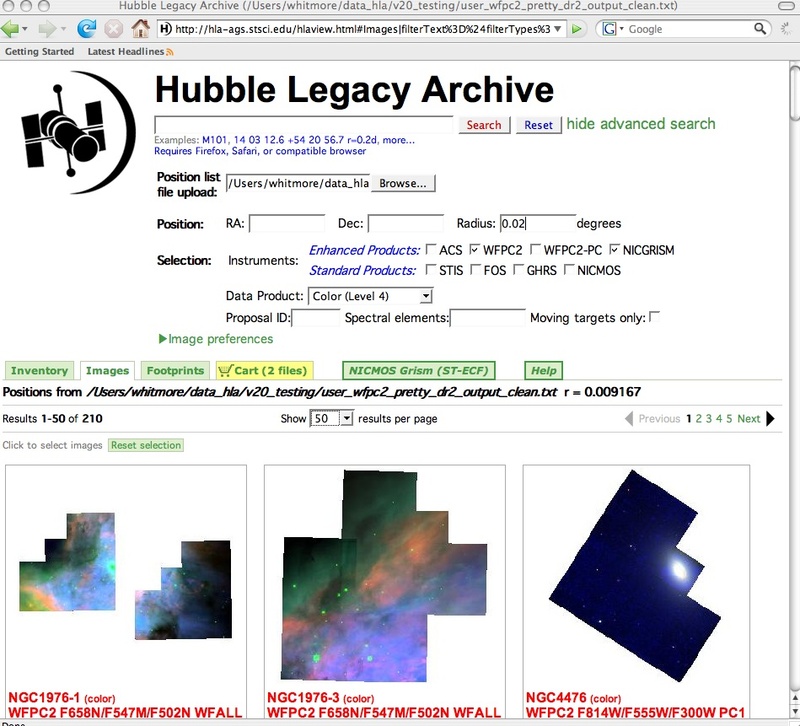 The HLA is an augmentation of the Hubble Space Telescope data archive service. 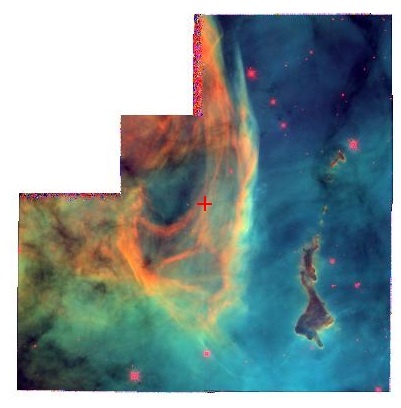 The goal is to optimize the science coming from the telescope by providing better browsing capabilities and easy access to both standard and enhanced Hubble products. The project is a collaboration between the Space Telescope Science Institute (STScI), the Space Telescope European Coordinating Facility (ST-ECF), and the Canadian Astronomy Data Centre (CADC). The advanced search has several new features including a position list file upload capability, filters to select on proposal ID, filters, or moving targets, and a "shopping" cart to download more than one file at a time. The HLA currently contains enhanced products for ACS, WFPC2, and NICMOS GRISM extractions (from ST-ECF), and standard products for NICMOS, STIS, FOS, and GHRS. Here is a matrix describing what is currently in the HLA. of ACS data from Jan. 13 - 27, 2008, which will be added soon. various user interface features including user-provided background images for footprints and further enhanced plotting and quick look analysis tools. We value your comments, suggestions, and ideas. Please send us feedback at archive@stsci.edu. 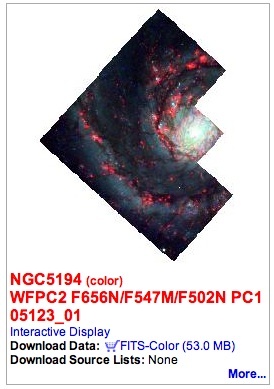 In preparation for the decommissioning of WFPC2, the WFPC2 team has completed a series of calibration and software enhancements to the WFPC2 calibration pipeline, including improved photometric calibrations and geometric-distortion coefficients, correction of the photometric errors caused by the WF4 anomaly, and the production of a PyDrizzled image for each WFPC2 data set. 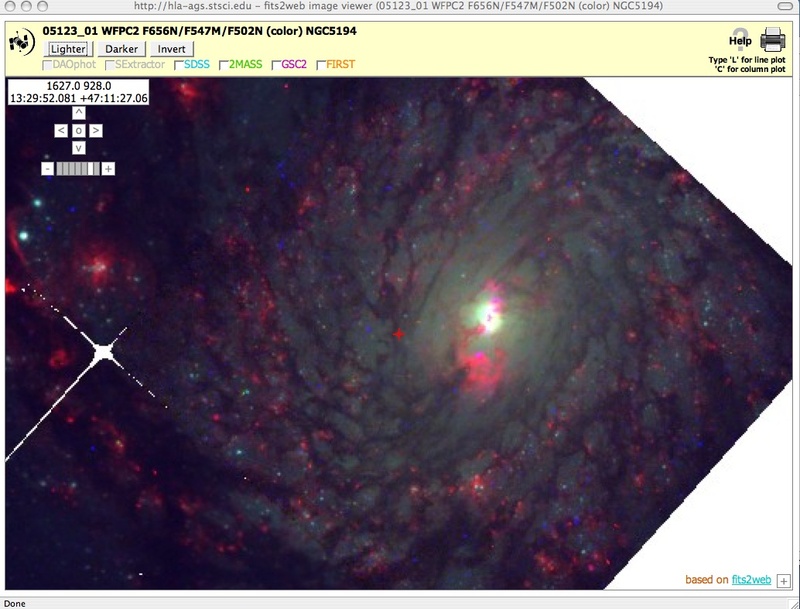 Using the new pipeline, we are preparing to reprocess all WFPC2 data in the HST archive. Reprocessing will begin later this month and continue through the end of the year. The reprocessed data files will be stored in both the waiver FITS (WFITS) format traditionally used by WFPC2 and in standard multi-extension FITS (MEF) format. For more details, please visit the WFPC2 web site. While reprocessing is under way, requests for data sets that have already been reprocessed will be fulfilled using the new static archive. For these data sets, users may request data in either MEF and/or wFITS format; the default is wFITS. Data sets that have not yet been reprocessed will be calibrated using the OTFR system; for these data sets, only wFITS files will be available. Once reprocessing is complete, on-the-fly reprocessing will be discontinued, and calibrated data will be supplied directly from the static archive, in both formats. Operations staff will maintain a webpage with the status of the reprocessing effort. PEARS is the Probing Evolution And Reionization Spectroscopically HST program with PI Sangeeta Malhotra. PEARS was conducted in the GOODS North and GOODS South fields using the Advanced Camera for Surveys (ACS) in Cycle 14. Slitless spectra over both fields were obtained with the ACS Wide Field Camera (WFC) and the G800L grism over the 204x204 arcsec detector area. Short F606W images were also obtained to align to the GOODS astrometry and to provide the zero point of the slitless spectra. The G800L grism provides slitless spectra with a dispersion of about 40Å per pixel, but the achieved spectral resolution depends on the size of the dispersing object. For a point source, the measured resolution is about 100Å varying with wavelength. The grism first order covers 5500-10500Å with peak sensitivity around 7500Å. The MAST PEARS website provides access to the FITS files containing the spectra and to the catalogs. MAST provides a search interface for the data. Clicking on the Data ID in the search results, will bring up a quick-look page with the object images, the grism from each epoch and a plot of flux vs wavelength for each epoch. The images and plot below are from the quicklook page for PEARS data id N100001. The Coma cluster team has recently added a set of SExtractor source catalogs for the 23 fields of this release. Coma cluster images and catalogs are available at the MAST. The release notes describe the catalogs. COSMOS is a HST Treasury Program to survey a 2 square degree equatorial field with the ACS in the I band of the VIMOS equatorial field. The first release of the data was in 2006. The COSMOS team has prepared new versions of the ACS, NICMOS and GALEX science-ready data products and these are now available from MAST. See the MAST web page for more information about downloading the data. The International Virtual Observatory Alliance (IVOA) holds two Interoperability Meetings per year. The Space Telescope Science Institute and The Johns Hopkins University Department of Physics and Astronomy are hosting the second meeting of the year October 26-31, 2008. The IVOA website for the meeting is http://www.ivoa.net/cgi-bin/twiki/bin/view/IVOA/InterOpOct2008. The IVOA's mission is to facilitate international coordination and collaboration in the development and deployment of the tools, systems, and organizational structures needed for the utilization of astronomical archives as an integrated and interoperating virtual observatory. The work of the IVOA focuses on the development of standards. Working Groups are constituted in those areas where key interoperability standards and technologies have to be defined and agreed upon. The IVOA also has Interest Groups that discuss experiences using VO technologies and provide feedback to the Working Groups. The Interoperability Meeting is an opportunity for the Working Groups and Interest Groups to have face-to-face discussions and for technical questions to be resolved. Participation is open to anyone with an interest in VO standards and technologies. There is no registration fee. MAST has established the "MAST Forum" in response to suggestions from our user community. You can find a link to the Forum on the second line of the top navigation bar of most MAST web pages. It should be the right most link on each page. The forum is a place for MAST users to post topics related to the MAST archive, either suggestions or questions on using MAST tools and services are welcome. Recently we have been considering changes to the MAST website to improve navigation. We have posted a topic related to this in the forum and are looking forward to seeing a discussion on this topic by our users. To avoid spam postings, you will need to register on the forum to post.